Today, on this joyous feast of Holy Easter, with the words of the hymnist we praise our Lord and Savior, who is risen from the dead, destroyed hell, and with His resurrection gave life to His creatures. Christ’s resurrection shined onto the darkness of death the light of eternity, bestowing on mankind the blessedness of the heavenly kingdom, and the grace of a resurrected life on this earth and in the life to come. With Christ’s resurrection, a new creation, a new mankind, which is emancipated from sin and the curse of death, lives in the grace of God and is made worthy of eternal life. In accordance with the words of the apostle, “old things are passed away; behold, all things are become new.” (2 Corinthians 5:17). For the only begotten Son of God, our Lord and Savior, “who hath abolished death, and hath brought life and immortality to light through the gospel:” (2 Timothy 1:10). The Gospel of Jesus Christ is the gospel of resurrection, the gospel of eternity, the gospel of life; through which comes to us the understanding of God’s boundless love, the Lord’s voice, that gives life to souls; and the truth of the resurrection of Christ. Today, in front of the mystery of the Lord’s miraculous resurrection, the question naturally arises – to what extent are we living the life that Christ has renewed for us, to what extent are we following the Savior’s words and commandments? What do we cherish in our lives? The gospel of resurrection, or wandering teachings and deceitful ideologies? Following the will of the Lord, or sinful, life-destroying paths? Accumulating treasures in heaven, or greedily aspiring for worldly gains? Spiritual freedom, or shameless unrestrained living? True righteousness and honesty or the “justice” Pilate sought? Do we choose Jesus, or Barabas, the bandit? Alongside the unprecedented progress in science and education, we also witness in our days the destruction of traditional values, humanity’s moral decay and evidence of bankrupt spirituality. Yet, in the state of life’s modern conveniences, fast pace, and opportunities; people, even family members, are estranged from one another. In the midst of plentiful goodness, neither need, nor hardship is eliminated, but rather society becomes progressively polarized. While life has become easier through the advances of technology it has also facilitated new means of warfare and terrorism, which continuously shake the world, becoming a common threat against humanity. In light of these realities, and at all times, it is imperative that we all realize and speak out about divine justice and atonement on this earth and in the life to come, which is imminent for every individual and nation. Indeed, Christ-given resurrection is not merely a gift, but also subject to judgment, as is written in the Gospels, “Marvel not at this: for the hour is coming, in the which all that are in the graves shall hear his voice. And shall come forth; they that have done good, unto the resurrection of life; and they that have done evil, unto the resurrection of damnation.” (John 5:28-29). The journey of resurrection and life is the rejection of everything that makes us slaves to sin, for: “For the wages of sin is death; but the gift of God is eternal life” (Romans 6:23). It is with this understanding that the Apostle emphasizes putting on the heavenly, “that mortality might be swallowed up of life” (2 Corinthians 5:4-5). The life that swallows death, is a life of spiritual fullness, longing, and an effort to live in God; in mind, heart and the entire strength of soul; and, in accordance with the commandments of the Gospel which injects the strength of the resurrected life into the individuals and people who have put their trust in Christ. The world filled with anxiety and turbulence as well as our own reality, which is likewise filled with worrisome difficulties and problems, can be transformed by a life of spiritual fullness granted by Christ, conquering mankind’s pains and tragedies, and establishing the foundation of security and happiness everywhere. Christ’s resurrection is an ever-resounding invitation for the world to rise from sin towards grace; so that all that spreads death and distraction may be swallowed by the life, led and lived by God. Christ’s resurrection is the foundation and the reinforcement of faith, which enlightens the hearts of humanity, grants consolation and hope to those mired in hardship, imparts strength and power to rise from the sufferings of “golgothas”, bestows courage and a brave spirit in just struggles, inspires dedication, and gives joy and elation to live and create. This spirit and path are natural and characteristic for our people, our life, and history, and illuminate our present and future. Rising, facing difficulties undaunted, building a new life – our people testified to these through the re-establishment of our independent state, which will celebrate its twenty-fifth anniversary this year. In our efforts of strengthening our homeland, building and empowering our national life, as well as confronting the challenges before us today, dear beloved, we have the faith and light of Christ’s resurrection leading us. Hereupon, let us fill our lives with the love of our Lord, mutual support, and with the good news of God-pleasing labor. Through the mystery of Easter, our souls shine with the grace of the resurrection that Christ has bestowed upon us, which is sealed on our lives when we live with faith and Christian values, for our dear ones, our people, our homeland, and our Holy Church. You granted life to Your creatures. 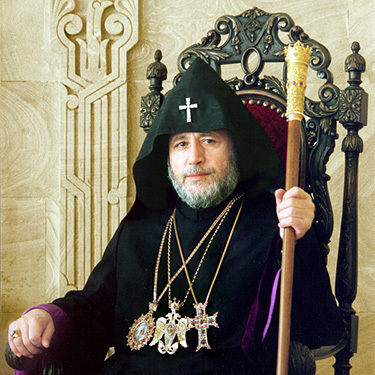 With the joy of the Holy Resurrection of Christ in Our heart, we greet the incumbents of the hierarchical sees of our Apostolic Holy Church; His Holiness, Aram I, Catholicos of the Great House of Cilicia; the Armenian Patriarch of Jersualem, Archbishop Nurhan Manoogian; Armenian Patriarch of Constantinople, Archbishop Mesrop Mutafian; and to all the oath-bound clergy of our Church. We convey our greetings in the love of Christ to the heads of our Sister Churches, beseeching the Lord for His abundant grace to be poured from heaven upon their God-protected flocks. With the good news of the resurrection we greet and bring our best wishes to the President of Armenia, His Excellency Serzh Sargsyan. We extend our greetings to President Bako Sahakyan of the Republic of Nagorno Karabakh; Armenia’s state officials, and the representatives of diplomatic missions accredited in Armenia. We bring our love and blessings to all our people, in Armenia and in the Diaspora. On this day of Easter, filled with hope and grace, it is our plea that the graces of the risen Christ be widely spread all over the world and in our homeland, that peace reign everywhere, and humanity, raised out of the caverns of tragedies and sorrows and hardships, build its life with hope and faith, full of love, brotherhood and solidarity. May the love of Our Lord Jesus Christ and the mercy of God remain with us and all, today and forever. Amen. Blessed is the Resurrection of Christ. This entry was posted in Featured News, News and tagged Apostolic Holy Church His Holiness, Archbishop Mesrop Mutafian, Armenian Patriarch, His Excellency Serzh Sargsyan, Sister Churches by Orthodoxy Cognate PAGE. Bookmark the permalink.